After a spell teaching, he moved to Cornwall in 1970 to paint full-time; its rugged coastline has inspired his marine paintings throughout a career that has seen him commissioned by collectors worldwide and his paintings included in numerous private collections. Perhaps Geoffrey Huband's best-known works are the cover paintings for Alexander Kent's superb Richard Bolitho series of novels. Alexander Kent has written: "Geoffrey Huband is an artist totally dedicated to his work. Since fate brought us together, I have been increasingly impressed by his ability to capture every mood of the sea, and the authenticity with which he brings his ships to life..."
He was employed by “Warner Brothers” as a Concept Artist on the feature film Harry Potter 4 “The Goblet of Fire” where he conceived and designed the “Durmstrang Ship”. His work has been commissioned by “National Geographic” He has also been the featured artist in “Classic Boats”, “Traditional Boats and Tall Ships” as well as “Shipwright International Annual of Maritime History” In 2017 he was employed by Universal at Shepperton Studios as concept artist on the feature film "The Voyages of Dr. Dolittle". 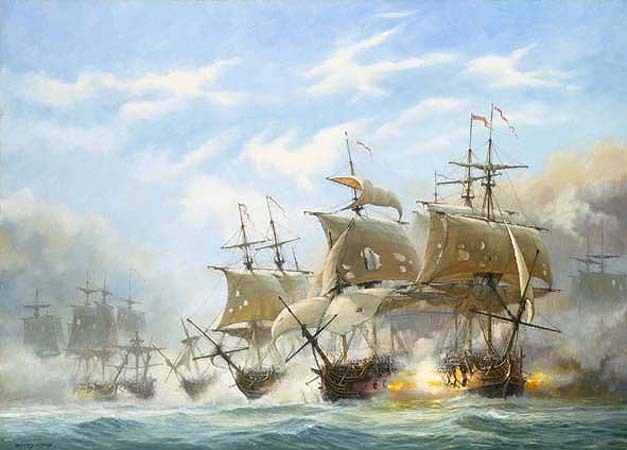 Huband has exhibited in the UK and Spain also with the Royal Society of Marine Artists, The Royal Institute of Oil Painters, The Royal Institute of Water Colour Artists and with Mystic Seaport Gallery, Connecticut since 2002. His most recent awards have been The “Award of Excellence” from the Maritime Gallery, Mystic Seaport in 2009 and the “Conway Maritime Award” from the RSMA in 2012. Larger images are available on request. Geoffrey Huband works mainly to commission. 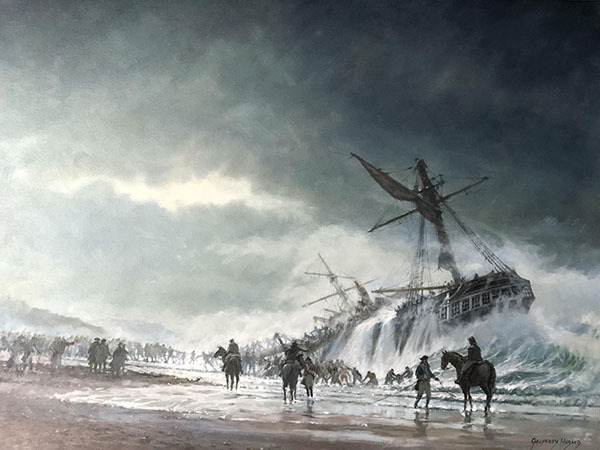 If you would like to acquire a painting by this brilliant and highly-regarded marine artist, depicting a historical or fictional subject of your choice, please contact Julian Thomas. Art Marine has over twenty years of experience in commissioning marine art, and we ensure an enjoyable and rewarding experience for our clients. Huband states of his work: "Visually I am intrigued by the abstracted qualities of maritime painting. The solidity of hulls, the apparent delicacy of masts and spars, the fragile beauty of sails billowing or revealing the form of the masts as they are blown aback. I enjoy the ordered tracery of rigging seen as a bold statement against the bright sky. My interest in maritime painting is excited as much by the physical appearance of ships as it is by the romance that time and history have endowed upon the subject. I am interested in ships for their beauty as well as for their functional qualities, and I am fascinated by the ingenuity that has been displayed in their construction and development since earliest times. The focus of my interest centers between 1700-1800, a period I regard as the peak of achievement in the combination of function and beauty in ships as well as architecture."